Maggie's Notebook: Henry Cab Tice is Byrd Billings Arrested Debtor: Tice Billings Mexican Mafia? Henry "Cab" Tice owed Byrd Billings $10,000.00. Byrd Billings and his wife Melanie were murdered on July 9th in Beulah, Florida. Latest update 8-22-09 10-24-09. Henry "Cab" Tice has been arrested by the Escambia County Sheriff, on "suspicion of grand theft," and he is considered "a person of interest" in the murders. 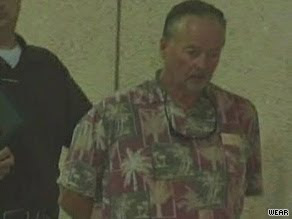 Byrd "Bud" Billings filed a complaint against Tice in May 2008 "related to the theft of the cars. [Billings family] We have faith that Sheriff Morgan will be diligent in determining whether there is any connection between Cab Tice and the murders." [Sheriff Morgan] Asked whether Tice's charges are related to the slayings, Morgan said, "Not at this time." But he said he will release further information about Tice's "dealings in the car business as it relates to the Mexican Mafia." The sheriff described those dealings as under-the-table cash sales of cars along the border to be resold in Mexico. Tice had borrowed up to $50,000 at one time from the Mexican Mafia, and was in debt to them, Morgan told reporters. He declined comment on whether police believe the Mexican Mafia had ties to the Billings slayings. At the time of Byrd Billings' death, he was trying to recover the money through civil court. Seven persons are held on charges of murdering the Byrd and Melanie Billings. An additional person is jail on unrelated charges, but is on bail on charges of "accessory after the fact," in the murders. The organizer of the murders, Leonard Patrick Gonzalez, Jr. is considered the ringleader and and while robbery is believed to be the motive known to other participants, it is also believed that Gonzalez, Jr. may have been hired for a contract hit. Patrick Gonzalez, Jr. told authorities that Cab Tice asked him to "whack" Byrd "Bud" Billings, and said several auto dealers wanted him to "whack" Billings. Read this new detailed report here. Gonzalez has been tied to Pamela Long Malden Wiggins' husband Hugh: Hugh Wiggins is Pamela Long Wiggins Husband, Patrick Poff Gonzalez Friend? Tabatha/Tabitha Gonzales, Patrick Gonzalez, Jr.'s wife, has further tied Henry Cab Tice to her husband. Tabitha says that Cab Tice introduced them to Bud Billings. She said Billings donated $5,000.00 to fund the Gonzalez' self-defense school, and indicated that Billings wanted to invest in the business - but it is not clear whether the $5,000 was the total investment, or if he wanted to invest even more. Tice also loaned them money. Tice is now under arrest. Mrs. Gonzalez further tied her husband to a long time relationship with Hugh Wiggins. To read her interview with the Sheriff's Department, go here. "Cab" Tice reportedly told authorities that Patrick Gonzalez, Jr. was like a son to him, and then clarified that it was "like the wayward child that you always want to try to be a good influence on his life." Patrick Gonzalez told authorities that Cab Tice asked him to "whack" Bud Billings. It gets more appalling every day. Tice said that his Hispanic American Auto Sales business was failing and he borrowed $20,000 from an employee, Salvano Gonzalez, who in returned borrowed money to give to Tice from the Mexican Mafia. Tice claims he was unaware the funds came from the Mafia source. Tice owned Bud Billings thousands of dollars, borrowed through Billings' WorldCo Financial. It seems Tice wrote "worthless" checks to Billings totaling more than $10,000 to Billings. When Hispanic American closed, Tice said the man inferred he had gotten the money from cousins in Atlanta in the Mexican restaurant business who were "members of the Mexican mafia." Tice said the man told him that the mafia members "won't kill you, but they'll kill your family and we've got to get them this money." Also, Tice said, the employee told Byrd Billings and Tice's ex-wife that Tice was in debt to the Mexican mafia in an effort to get those people to reinforce to Tice that he needed to pay back the money. "Bud said, you know, 'I can't believe you got in such a bind you borrowed money from the Mexican mafia and you know how dangerous these people are and you know what they'll do,' " Tice said. Tice said he still owes the "employee" $1500 and he has missed two payments this month. Byrd Billings' civil lawsuit against Tice is still pending. NOTE: All major updates are first added to my original post on the Billings murders, and then added to other relevant articles in the case. You can access the original here. Henry Cab Tice Mexican Mafia: Henry Cab Tice, Bud Billings Contract Murders?